In 1970, Steven Frykholm was working as the in-house graphic designer for the furniture manufacturer Herman Miller, Inc., when a company vice-president stopped by his desk. Every summer, the VP said, Herman Miller hosted a company picnic. Perhaps Frykholm would make up a poster for the event? Frykholm already had a passion for screenprinting, a method of printmaking that lends itself to flat, bold areas of color—ideal for making a poster. He had taught himself how to screenprint years earlier when he was living in Aba, Nigeria. As a Peace Corps volunteer there, Frykholm had spent two years teaching at the government trade school for girls. With few materials at hand, Frykholm wanted to teach the girls a trade that would enable them to produce an income. Screenprinting offered an inexpensive, versatile and practical solution. Frykholm drew on his this printmaking experience to create a striking poster. He played off the picnic’s theme of Sweet Corn Festival by sticking an ear of corn between his teeth and asking a fellow designer, Phil Mitchell, to draw his face. 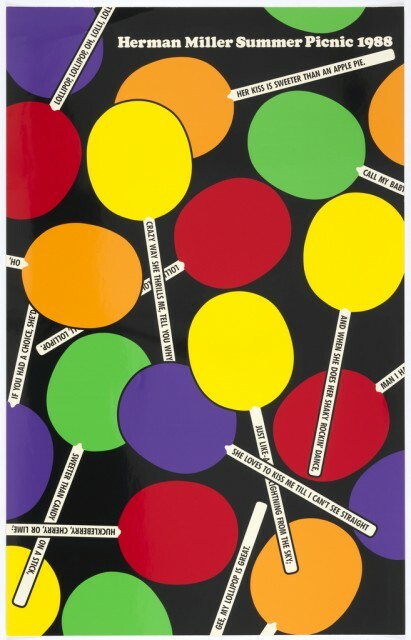 The poster went on to win an AIGA award, and just as the annual picnic had become part of the company culture at Herman Miller, so too did Frykholm’s picnic posters. He continued to design one a year for twenty years, featuring such classic picnic items as cherry pie, watermelon, ice pops, fruit salad and lemonade. 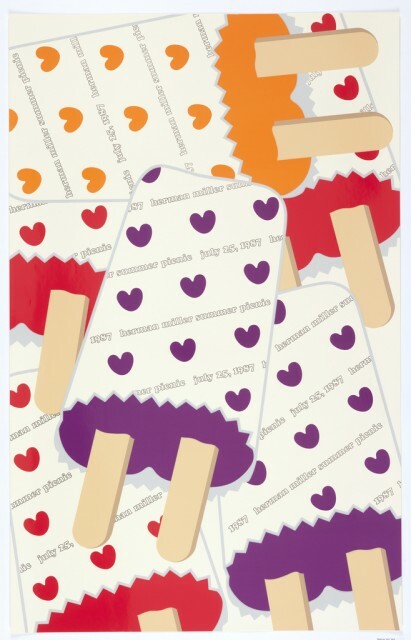 With their vibrant colors and close-up depictions of tasty summery treats, these posters still make me long to spread a blanket out on the lawn and join my friends in a meal. 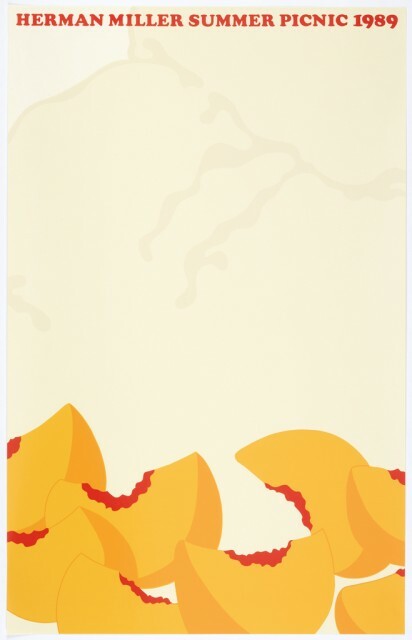 Posters: Herman Miller Summer Picnic, 1982-3/1988-9. Designed by Stephen Frykholm. Gift of Sara and Marc Benda. 2010-21-81-83/85. In case you hadn’t already heard, today is International Picnic Day! Grab a set of picnic-friendly wine glasses at shop.cooperhewitt.org and we’ll see you in the park! 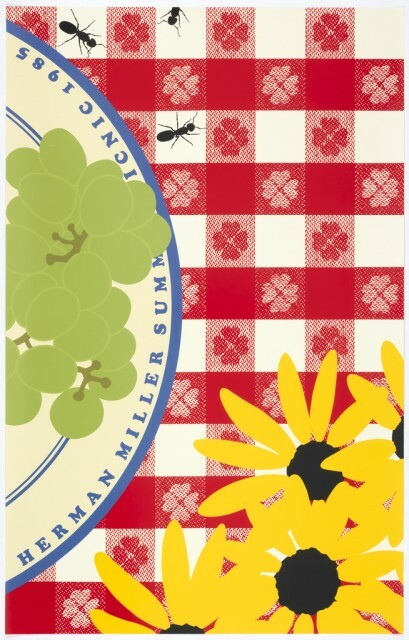 Poster: Herman Miller Summer Picnic, 1982. Designed by Stephen Frykholm. Gift of Sara and Marc Benda. 2010-21-80.